Mold (mould) is a type of fungi. Fungi are microbes, they are different from plants, animals or other microbes such as bacteria. Molds are eukaryotes. It means they have true nuclei in their cells while bacteria are prokaryotes and don’t have distinct nuclei in their cells. Molds grow in the form of multicellular filamentous hair-like structures called hyphae. The spores and hair-like structure of individual mold colonies are too small to be seen without a microscope. But when a lot of molds are growing on a surface, it often appears in black, brown, blue or green spots. Some molds cause disease and produce toxins, some are capable of breaking down and decomposing back of different organic materials into natural elements. Some others are used in production of various foods, beverages, antibiotics and enzymes in food and beverage industry. Molds are found everywhere both indoors and outdoors. Molds grow best in warm, damp building materials, and humid conditions, and spread by making spores. Molds release spores into the air. So, when mold grows indoors, the number of mold spores indoors is higher than outdoors. These spores can be inhaled by the residents and cause some allergic reactions and respiratory problems. 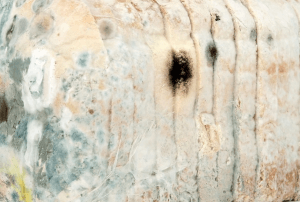 Mold spores are resistant to environmental conditions such as high temperature and dry conditions and can survive tough environmental conditions. Without water and food sources mold cannot grow. Food source for mold can be any food in your kitchen or any dead organic material such as cellulose. Mold is able to produce enzymes which we are not. These enzymes break down different organic chemicals in a simple form and then adsorb them. So mold growth can happen not only on your bread, cheese or orange but also on other organic materials made from wood and paper. Mold growth also requires moisture. The sources of water can be water leaks from plumbing, condensation, washing, cooking and air humidifiers. If you would like to get more information about mold, contact me Dr. Ava Masoumi at 310-971-6723.